In order to simplify the set up of our popular SPC-PSDs in an optical system SiTek now releases an SPC-PSD Evaluation Board. The Evaluation Board can easily be mounted on an optical table by using a standard 2” filter holder or screwed to for example an XYZ stage by using M6 screws. 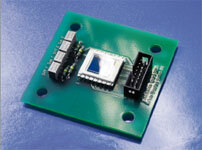 The board includes offset compensation electronics and a 14-pin connector that makes the inputs and outputs of the SPC-PSD easily accessible. Evaluation boards for both the J-lead and the DIL version of the SPC-PSD are available and, as all of our products, they are of course RoHS compliant.